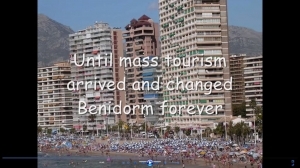 This movie introduces the topic of tourism at KS4 level by looking at a variety of issues that pupils will study. To enlarge the movie click on the tab in the bottom right hand corner. This presentation focusses on the different types of holidays exist offering different tourist experiences. This presentation shows the most popular tourist destinations for Brits each year, giving pupils an idea of the power of tourism, and the effect of tourism on these recipient countries' ecnonomies. This movie highlights the growth of mass tourism and looks at the reasons for it. To play full screen simply click on the tab in the bottom right hand corner of the screen. This presentation focusses on the advantages and disadvantages of mass tourism. 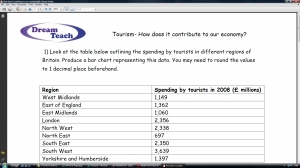 This worksheet gets pupils thinking about the ways in which tourism can impact upon a country's economy. This presentation introduces pupils to the Butler model and takes them through each of the stages. This presentation focusses on Snowdonia, one of the UK's most popular National Parks. It looks at the attractions, positive effects of tourism, negative effects of tourism, sustainability and recent developments in Snowdonia.